Die aktuelle, korrigierte Version aus dem 1. Beitrag installieren. einfach das Paket nochmal herunterladen und die Dateien überschreiben. Thank You very much for your Calendar! I just installed last version with phpBB 3.2.5 and liked it very much! It looks like You made a great progress during last year! I've caught several bugs, i'd like to report. I suppose, min(100, max(0, $num_friends)) will fix both issues. But i still like your Mod very much! I think, i'll make russian localization for it. If you have github or similar repo, i'd like to make a pull request to it. Or i can send you localization, if You'd like. thank you for reporting this things. I know it and i have changed it. I'll work through the other points. I would be happy to receive a Russian translation. You can use my email address from the composer.json of the extension. Glad to hear from you, Hermann! info_acp_calendar.php seems to have duplicate records 'ACP_CALENDAR_EVENT_CONFIG' with different values in all three languages (de, de_x_sie, en). The first value is lost. While the button caption and panel title share 'ACP_CALENDAR_EVENT_CREATE' string. 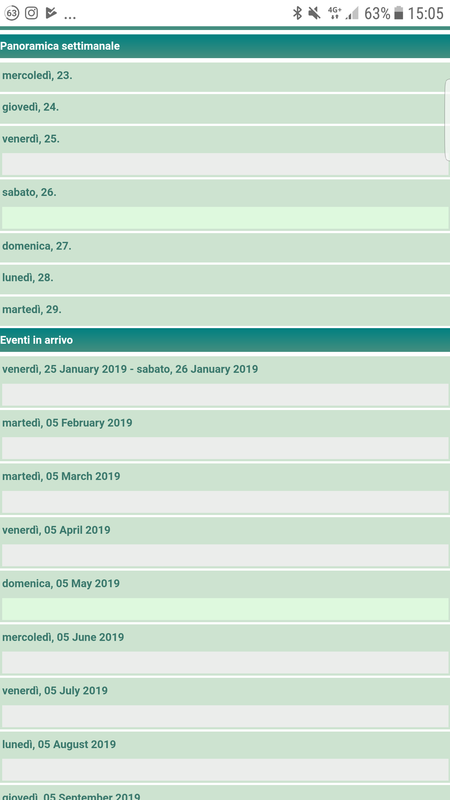 More important localization : i have non-localized dates in "Upcoming dates" panel (styled with 'CALENDAR_DATE_FORM', but English one, while by board and user have working Russian locale) and perfect localization in invited person registration dates. Registration dates are localized in main_listener.php at line 375 and upcoming dates -- at line 875. Real: Almost everyday event, except small ranges: Jan 1- Jan 15 2022, Jan 1 - Jan 15 2023 and so on. Special mention: 2-week upcoming dates panel showed events on Jan 1-st 1970, Jan 16-th 2020, Jan 17-th 2021, Jan 17-th 2022. Ok, I'll email it, as soon as it is ready! По ссылке в предыдущем сообщении лежит русский перевод для календаря hjw Calendar, для форума phpBB. Sorry, I don't understand a single word in deutsch, could you please answer my question in english? I'm making good use of this excellent extension on my board www.anonimagiocatori.it, but I've got problems in the mobile visualization. Why I can't see titles of events in mobile view?